President Trump speaks in the Oval Office of the White House during an event to honor Navajo Code Talkers who served in World War II. President Trump decided to bring up one of his favorite nicknames during an event honoring Navajo Code Talkers — but it's one that is widely seen as a slur offensive to Native Americans. "You were here long before any of us were here," Trump told the men who were being honored for their service during World War II, which helped transmit critical secret messages that helped the U.S. and Allied powers win the war. But then Trump continued with a reference to Sen. Elizabeth Warren, D-Mass. — "Although we have a representative in Congress who they say was here a long time ago. They call her 'Pocahontas.' "
The name is one Trump has used to demean Warren. She had claimed Native American heritage in a law school directory, and it later became an issue during her 2012 Senate campaign. Then-GOP Sen. Scott Brown, who is now Trump's ambassador to New Zealand, accused her of using that as an advantage to get ahead in her academic career. The Washington Post Fact Checker found that "outstanding questions about Warren's directory listing — and her relying on family lore rather than official documentation to make an ethnic claim — certainly raise serious concerns about Warren's judgment. But in the debate, [Brown] conflated conjecture and sketchy information to make a claim not supported by the available evidence." The Post gave "Two Pinocchios" for Brown's assertion that Warren had claimed she was Native American in applications for jobs at Harvard University and the University of Pennsylvania. Trump has called Warren "Pocahontas" 12 times on Twitter, in either his own tweets or retweets. He brought back the controversial term just a few weeks ago to hit Warren, who has been mentioned as a possible 2020 challenger to Trump. White House press secretary Sarah Huckabee Sanders defended Trump's use of the term on Monday, saying in the daily press briefing that it wasn't the president's intent to use a racial slur. "I think what most people find offensive is Elizabeth Warren lying about her heritage," Sanders said. Warren responded on MSNBC, saying, "It is deeply unfortunate that the president of the United States cannot even make it through a ceremony honoring these heroes without having to throw out a racial slur." 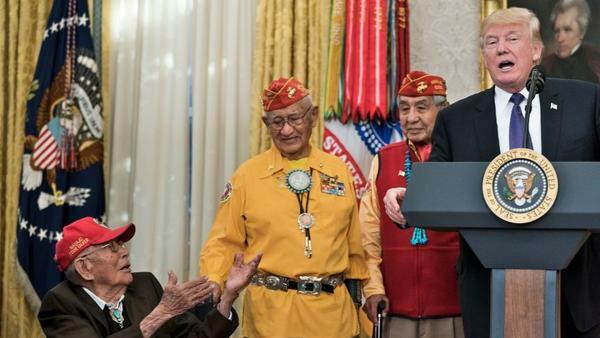 Three former Navajo Code Talkers joined the president on Monday, including Peter MacDonald, former chairman of the Navajo Nation. MacDonald shared the Marines' history and their role in keeping communications secret during World War II. MacDonald said the 13 surviving Code Talkers "still have one mission": to build a national Navajo Code Talker museum. "Why? Because what we did truly represents who we are as Americans. America, we know, is composed of diverse community. We have different languages, different skills, different talents, and different religion," he said. "But when our way of life is threatened ... freedom and liberty that we all cherish, we come together as one. And when we come together as one, we are invincible. We cannot be defeated." Trump declined to give his full prepared remarks after MacDonald, saying the retired Marine "said it better." National Congress of American Indians President Jefferson Keel said in a statement that it was regrettable that Trump's "use of the name Pocahontas as a slur to insult a political adversary is overshadowing the true purpose of today's White House ceremony." "Native people serve in the Armed Forces at a higher rate than any other group in the country, and have served in every war in this nation's history," Keel, a Vietnam veteran, said. "And we honor the contributions of Pocahontas, a hero to her people, the Pamunkey Indian Tribe in Virginia, who reached across uncertain boundaries and brought people together. Once again, we call upon the President to refrain from using her name in a way that denigrates her legacy." It wasn't just Trump's use of Pocahontas that was seen as a major faux pas, though. The Oval Office event also took place in front of a portrait of former President Andrew Jackson — who ordered the forced removal of thousands of Native Americans from the Southeast to the West, known as the "Trail of Tears." More than 4,000 Cherokee people died during the migration.